"Methycellulose" describes a family of different hydrocolloids, but when we use the term, we usually mean Methylcellulose F50, a food grade hydrocolloid best known for its ability to form a gel when hot and melting when cool. Methylcellulose is also useful as a foaming agent and as a thickener when cold. Use Methylcellulose to make hot ice cream that melts as it cools, perfect meringues, modernist gnocchi or even instant noodles formed as the mix touches a hot consomme. Let's break down the term "methylcellulose" for a moment. Cellulose is a carbohydrate, one of the most common naturally-occurring carbohydrates in plants. By itself, cellulose is a non-digestible but non-toxic polysacharride to make paper products and can be used in highly processed form for thickening of food products. The term methylcellulose or methyl cellulose refers to cellulose that has been treated with methyl chloride. The methyl group attaches to the cellulose and gives it unique properties. Methylcellulose F50 is perhaps best known for forming a gel when hot and melting when cool. Methylcellulose F50 is a gelling agent that gels when hot and becomes a liquid when it cools. Methylcellulose F50 also acts as a thickener when cold and helps to stabilize foams and emulsions. Different types and brands of methylcellulose may have different properties. 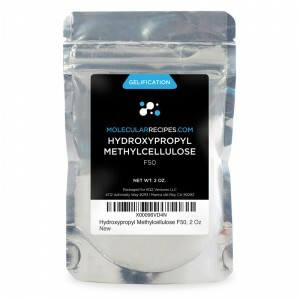 Hydroxypropyl Methylcellulose F50 is water-soluble, gels when warm, and can be used as an emulsifier to create stable foams. It has a mild vegetal taste that's easily suppressed by other flavorings. Methylcellulose is also marketed as MethoCel and can appear as Methylcellulose, Hydroxypropyl Methylcellulose, and Carboxymethyl cellulose. Of these, only the Hydroxpropyl version will gel when heated, but Hydroxypropyl Methylcellulose is often marketed simply as "Methylcellulose." Hydroxypropyl Methylcellulose is sometimes abbreviated "HPMC." Methylcellulose F50 is mostly used in molecular gastronomy to make stable meringues, hot 'ice cream' that melts as it cools, modernist gnocchi and melt-in-your-mouth instant noodles formed at the table as the mix touches a hot consomme. Methylcellulose can also be used as a binder in coatings such as frying batter to produce less oily results. Methylcellulose is used in our "Instant Pea Parmesan Noodles in Saffron Consomme with Morel Dust" recipe shown below. 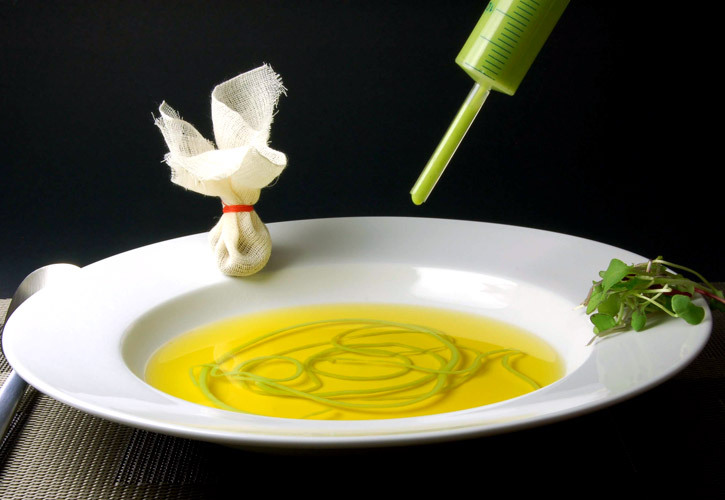 The noodles are formed in front of the diner eyes by injecting a pea and parmesan mix into a hot saffron consommé using a syringe. As the liquid gets in contact with the hot consommé, it jellifies forming the noodle. 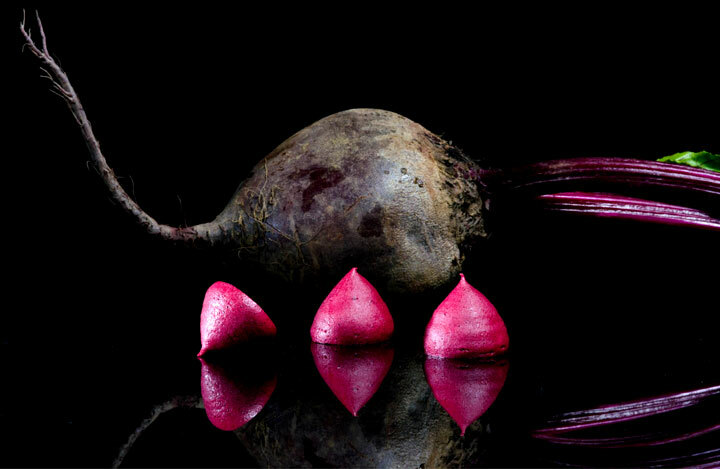 With Methylcellulose you can also make delicious savory meringue such as the "Beetroot Meringue Puffs Filled with Olive Oil Foam" shown below. ***Since there are so many different types of methylcellulose, it's very difficult to comprehensively list technical specs for every possible use case. If in doubt, try to find a product datasheet on the particular formulation you're using. 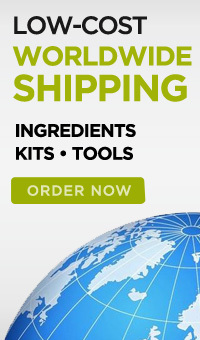 We've listed information for Hydroxypropyl Methylcellulose F50 here. Temperature (gels and melts): Gels between 62°C/143°F and 68°C/154°F. Texture: F-50 falls in the "semi-firm" category. Appearance: Forms a white foam or a slightly off-white gel. Flavor release: Good, but the methylcellulose itself as a slightly off-putting vegetal taste that is best masked by other flavors. Mouthfeel: For hot gels, think gellified pudding. For foams, a light airy foam is possible, while a foam made with xanthan becomes more stable and creamy. Allowed to dry, these foams become meringues with the same texture as a traditional egg white meringue. Freeze / Thaw stable: Yes, in that the gel will melt when cold, freeze, and then can form a gel again when heated. Syneresis (weeping): Yes, near the melting point. Shearing: Creates a shear-thinned gel, otherwise known as a fluid gel. Other Tolerances: Will gel in the presence of alcohol, but alcohol increases the temperature required to set the gel. Synergies with other ingredients: No specific synergies, but texture of foams is improved with other hydrocolloids, such as xanthan gum. Normally, it's best to disperse methycellulose into hot water, then allow to hydrate for several hours in the refrigerator. However, the particular formulation that we carry disperses well in luke-warm water. To make a stable foam, combine your flavor base (such as lemonade) with a 1% scaling of methylcellulose. Add a 0.5% scaling of xanthan to make the foam thicker and more stable. Blend with an immersion blender for 2-3 minutes, until the foam puffs up and sets. We've made a hot ice cream using a scaling of 3.2% methycellulose. To make the recipe, disperse the methylcellulose into your ice cream base, then let rest refrigerated over night. Then poach scoops of the ice cream in boiling water until set. Sounds crazy - but it works.